Eva Studio has released yet another new match-three game for players on Facebook: Fiesta, a party-themed game that sees gamers making matches with firecrackers to increase their size and eventually cause them to detonate on the board. The game’s match-three style asks players to swap the locations of touching firecrackers to make matches of three or more like-colored symbols vertically or horizontally. 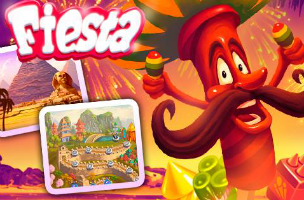 Fiesta greatly resembles King’s Pepper Panic Saga, as players start with small firecrackers that grow when matches are made. When firecrackers reach their maximum size and are used in one final match, they explode and send out a burst that causes all matching-colored firecrackers on the board to grow as well. Each level of Fiesta comes with a move limit and different goals to complete. These typically involve forming a large number of matches with specific colors of firecrackers. Other levels may see players making matches with firecrackers in a particular color order (like one match of red firecrackers, followed by a green match, etc.). In other games, making a match of four-or-more like colored symbols would typically form a power-up that removes one whole row or column of symbols from the screen. Here, these matches instead cause all firecrackers in a row or column to instantly grow in size. They aren’t remove from the board. This sometimes triggers large combo explosions, as a large number of firecrackers may reach their maximum size, all at the same time, regardless of their location on the board. If players trigger enough explosions in a single move, Fiesta mode is activated, causing even more explosions and a boost in points. In some levels, triggering this Fiesta mode is a requirement for completion. Players earn up to three stars on each stage, depending on their final score, and can compare their scores with their friends on the level-specific leaderboards. Eventually, players unlock power-ups to help them out, like a hammer that can be used to clear any one firecracker from the board, or a shield that can be used to protect firecrackers from being blown off of the screen. To be specific, certain levels contain water hoses, which will blow enlarged symbols off of the screen so they can’t be used in matches. This shield power prevents that. Fiesta is available to play for free on Facebook. The game is monetized via the purchase of power-ups, once the game’s free supply runs out.